Terry Chan Photography: I was out picketing with the WGA at Paramount today! I was out picketing with the WGA at Paramount today! 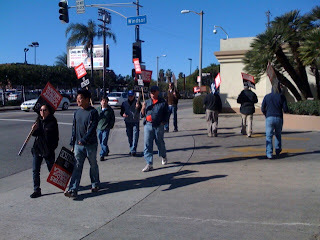 I was out picketing along side with the WGA writers in front of the Paramount Studios this morning. It was a cold windy morning, but I managed to toughen it out. Actually, I had a blast. Yeah, on contrary to most people's belief, picketing was fun. This was an initiative by our new CEO (well, it's been a year, in SAG relative term, it's NEW) Doug Allen, who encouraged all employees to take time out from work and volunteer to be on the picket line for the past 3 months. Today was my turn and I gladly accepted the assignment to break up the monotony of SAG's day to day mundane work.